My Greek Inspired Chicken Dinner. 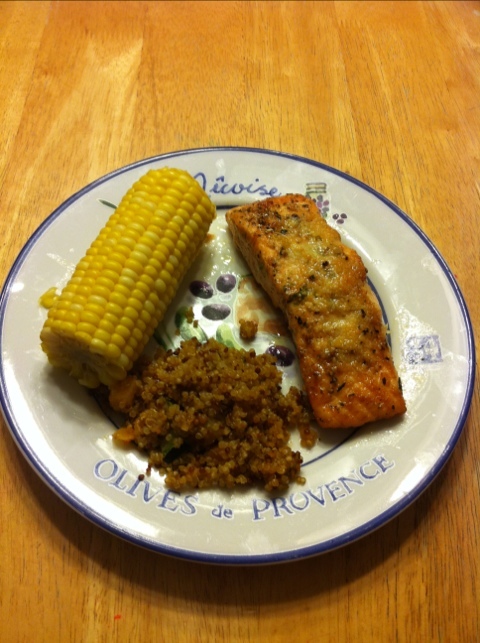 Tonight’s dinner was my version of a Greek inspired dish. It was simple and full of flavor. 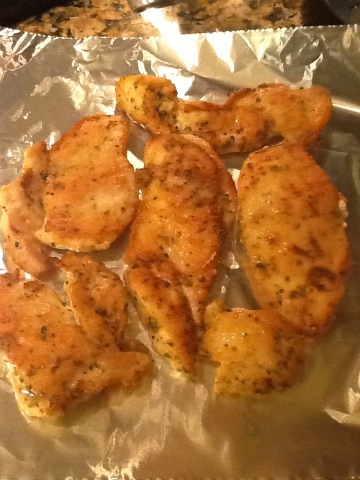 I simply took 2 chicken breast and sliced them so that they were about 1/4 inch thick. Then I lightly seasoned the chicken. 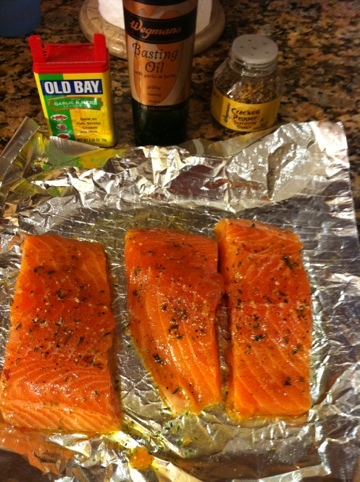 You can use your favorite seasonings. 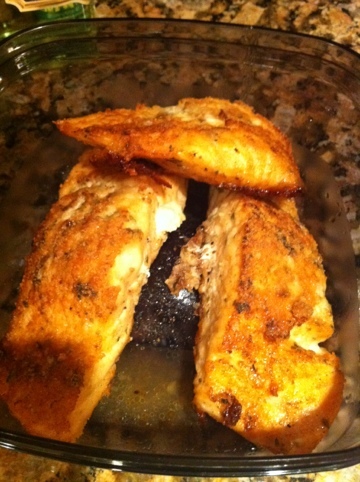 I used a combination of black pepper, paprika and sea salt. 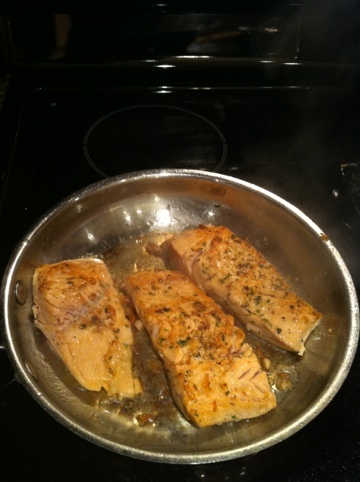 I also added a little of the Wegmans Basting Oil. 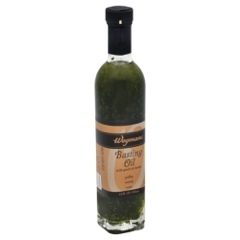 I actually used this basting oil for almost all of my dishes. I then sautéed it in extra virgin olive oil. I cooked the chicken for 5 minutes each side until it was golden. 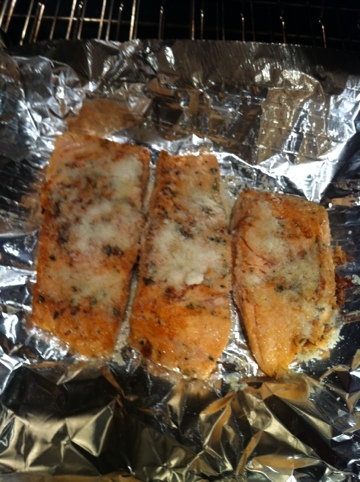 I then wrapped it aluminum foil and put it in a 400 degree oven and let it cook for another 10 minutes. While the chicken was cooking in the oven, I threw in the naan bread. Note, I literally threw it in the oven directly on the racks and let it stay for 3-5 minutes until it was golden brown. The chicken and naan were cut and placed on a platter that included cucumbers, brushetta, feta cheese, pesto and grapes. I also served a side of Kashi 7 Whole Grain Pilaf. 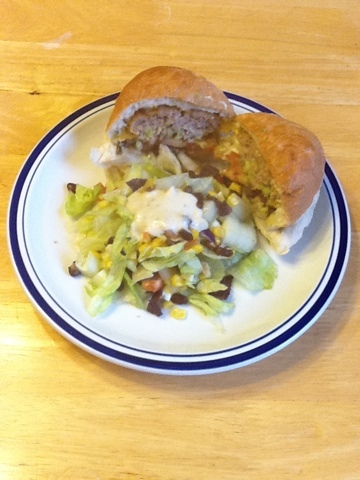 The combination was a flavorful and enticing to the tastebuds. Today I had a pleasant culinary surprise. 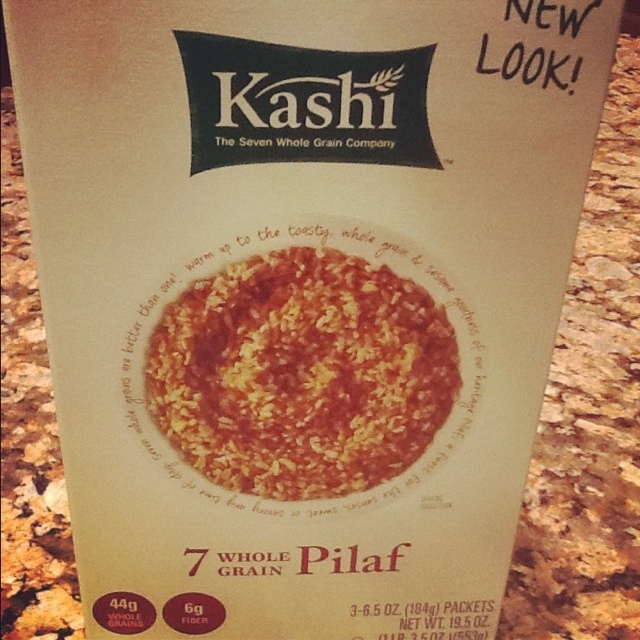 I tried this Kashi 7 Whole Grain Pilaf and it was delicious. I was nervous about it being dry and rock hard. However, it was quite tasty. Now, I did boil it in chicken broth and I also added a teaspoon of the Wegman’s garlic parmesan cheese finishing butter. So, I definitely think doing those things added flavor. I also cooked it for 30 minutes instead of the recommended 25. It ended up being a tasty side dish and a nice healthy alternative to white rice and pasta. 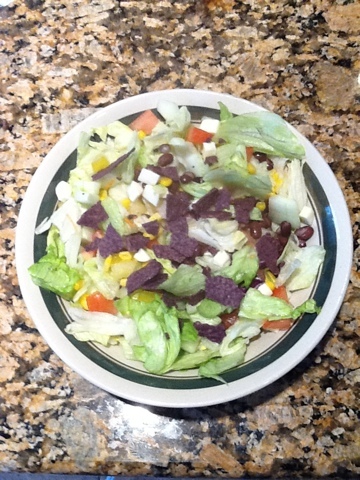 Looking for a quick & healthy lunch or dinner idea? 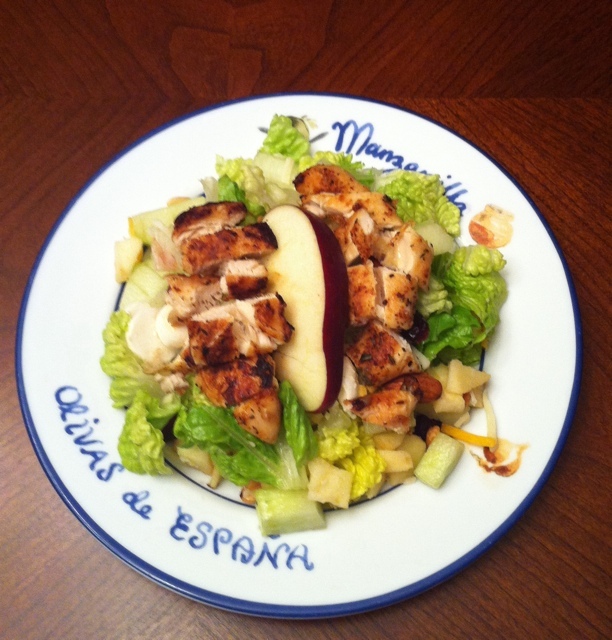 Try this simple but hearty salad with chicken, diced apples, almonds, cranberries, pinenuts & cheese (mozzarella & cheddar). Serve with a honey mustard or balsamic dressing. I chose the ingredients based on items I had in my fridge & pantry. Feel free to substitute based on what you have. So, I had a busy day today and finally arrived home with a growling belly. There’s something you should know about me. When I’m really hungry I get frustrated. And, there’s no greater frustration than not having something satisfying and ready to eat. Well, that was me today. I looked in the fridge and saw nothing that immediately called me out. Penny, Penny, eat me. That’s what I wanted to hear but I wasn’t hearing it. I saw some spinach and shrimp hiding in the corner. I had made that for dinner yesterday and served it with rice. It was good yesterday but I just didn’t feel like eating it again today. There was also some leftover brushetta that I had used as a dip for my favorite blue corn chips. However, I really wasn’t in the mood for dipping. There was lunch meat and I always keep an assortment of cheeses (fresh mozzarella balls, cheddar, parmesan, etc). Again, not really hearing Penny, Penny, come eat me for dinner. There was plenty of food in the fridge but nothing was really seducing my taste buds. Just when I was about to give up, I thought I would peep in the fridge. That’s when I noticed a single Garlic Naan Bread. 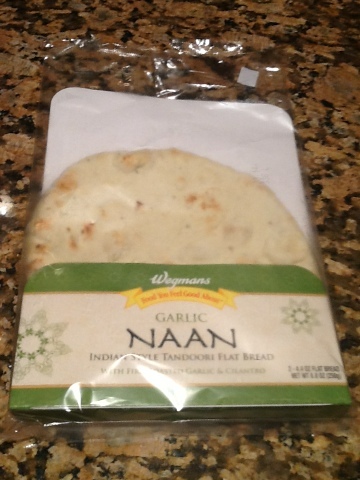 For those who may not know, Naan Bread is Indian style Tandoori flat bread. While it’s usually served as a side item at many Indian recipes, I like to use it to make pizza. That’s when it all hit me. Ohhhh, what if I took the fresh Mozzarella cheese balls and sliced it and placed it over the pizza. 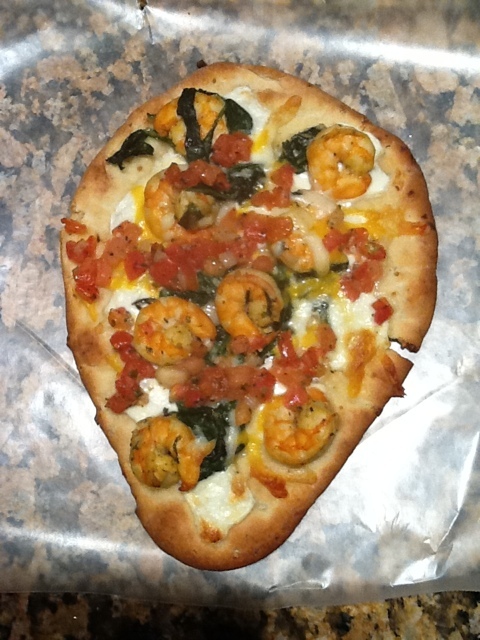 Then I decided to spread some of the Spinach and Shrimp on top of the Mozzarella. Shoot, while I’m cleaning the fridge, why not throw that Brushetta on top of everything. Finally, I topped it all off with a little Cheddar Cheese. My little creation was then thrown in a 425 degree oven for about 10-15 mins until the pizza got a nice golden brown. Sometimes, I yearn to be inspired. However, inspiration for me does not just show up on demand. Instead, it just arrives, like a random thought. Minute in the bigger scheme of things but significant enough to make me feel an internal spark that is completely fueled by creativity. One day not so long ago I felt that spark upon seeing a picture of a beautiful salad. Despite not knowing exactly what it was I was inspired to try this beautiful yet unique dish. The salad was not made with lettuce, croutons or covered with a heavy dressing. 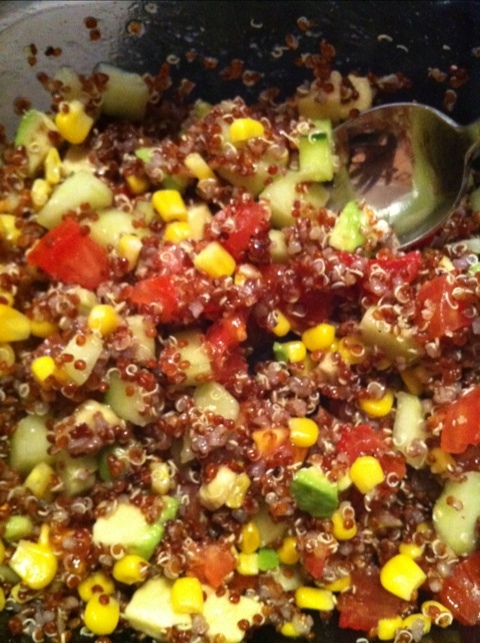 Instead it was made with a grain I had never heard of called Red Quinoa. I could barely pronounce it. I felt like Kanye West, “Pass the versaychee” (instead of Versace). I asked my favorite chef at Wegmans about the “Kwuh-No-Uh” only to later find out from one of my vegetarian friends that it was actually pronounced “Kwin-wah”. I may not have been able to pronounce the name of the grain but I knew I wanted to make salad. This salad was so colorful that it looked like a bowl full of jewels. I was immediately inspired to try this dish. I thought to myself, this salad makes me feel healthier just by looking at it. I felt like I had already lost 15 pounds and was ready to go on a 5 mile run. So, of course, I decided to make this superfood that would give me super powers. Well, unfortunately much to my chagrin, no 5 miles runs were or are in my future (although I will walk the heck out of any trail) and for darn sure no 15 pound weight loss. However, all illusions were worth it as this is one tasty dish. It is also easy to make and since Quinoa is a superfood, (It contains more protein than any other grain) it is super duper healthy and good for you. I try not to eat much pasta and while I love my veggies on the side, I was happy to have an additional side dish to add to my rotation. 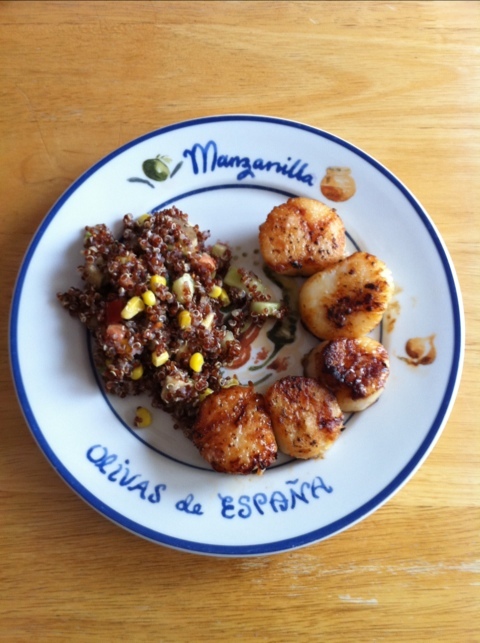 I ended up serving my salad with juicy, tender, pan seared scallops. As I enjoyed each morsel I felt like I was eating lunch at a a fancy cafe instead of in my kitchen. Something about this dish just transported me to another calming relaxing place. Of course, that could also have been due to the fact that my children were in their respective daycare and school and I was home with a rare day off. Wow, I need to have another day like that soon, but I digress. Now, I must be clear, I can not take credit for creating this salad. 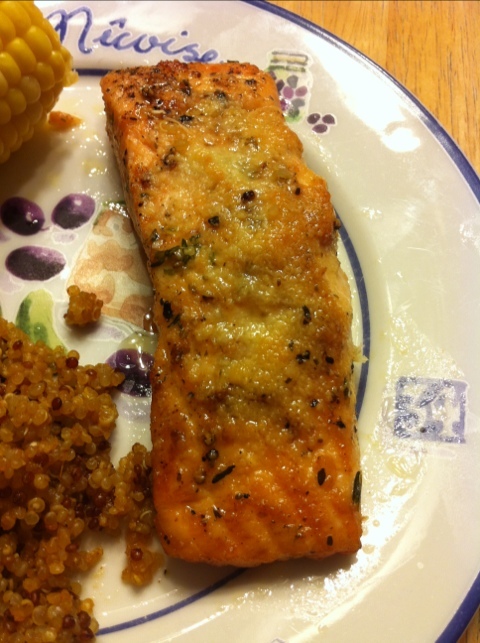 It is a recipe completely created by Wegmans (www.wegmans.com). However, I enjoyed it and I thought you might enjoy it also. I also I chose to use Garlic Expressions vinaigrette instead of the lemon dressing they recommended and I added half a cup of chopped cucumber. If you know me, then you know I can rarely make a recipe without adding my own touch to it. So without further adieu I present to you the recipe for this delicious salad. 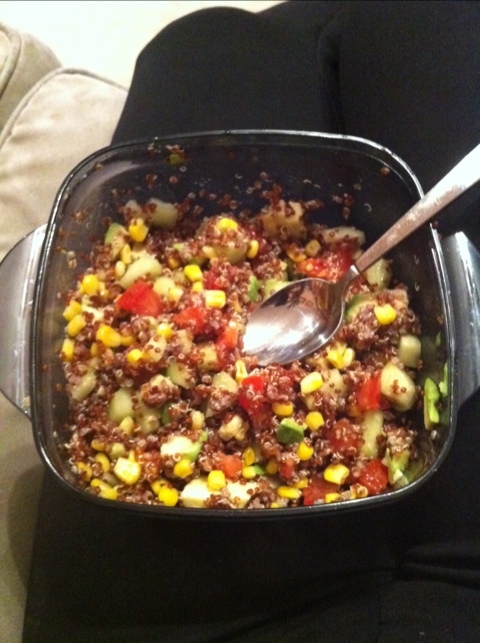 Add cooked quinoa, corn, cilantro, green onions, and tomatoes to mixing bowl. Fold in avocados and dressing; mix until well-combined. Season with salt and pepper; serve. Nutrition Info: Each serving (1 cup) contains 210 calories, 27 g carbohydrate, (4 g fiber), 5 g protein, 9 g fat, (1 g saturated fat), 0 mg cholesterol, and 240 mg sodium.